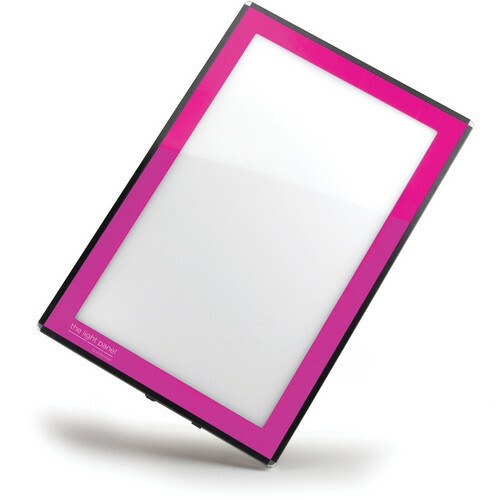 16 x 18" uxruxaczcqstzzcwzeabcddaettu 18 x 24"
Featuring a sleek, thin-profile, this pink LED Light Panel from Porta-Trace / Gagne is a portable light box offering a viewing area of 16 x 18" for inspecting transparencies, film, and other translucent materials. A thick Plexiglas work surface is durable and also helps to evenly diffuse the light from the bright white LEDs for even, uniform lighting from edge to edge. Additionally, the aluminum alloy frame also contributes to the overall durability and is also lightweight to complement the thin, portable design. Removable 100-240 VAC power adapter permits use in the USA and abroad. Eco-friendly long-lasting LEDs are rated for up to a 50,000 hour lifespan. Proudly manufactured in the USA with all components UL, RoHS, and CE-compliant. THE SIZE OF 16 X 18 ....IS THAT THE WHITE AREA OR THE PANEL ITSELF?